The Pythagorean Triangle of life is a great symbol and concept how to reach harmony in a society. A society is a complex system of people trying to life together in harmony. The Pythagorean Triangle describes how it should be achieved. Pythagoras was fascinated by triangles. He found the triangles are a universal concepts to describe nature. The number three was the number of harmony in his tetraktis. The tetraktis is a picture of ten dots arrange in a triangular shape. This image represented the essence of Pythagoras’s teachings. The whole game or drama of life is playing between three points, Pythagoras mentioned. The first point is the self. With self he understood our spiritual self, the soul. The body is not part of that and already belongs to the second point: the life. Life is the material existence outside of the soul. In our society we mainly only with these two points. The number two for Pythagoras was the number for duality, opinion, choice and the potential between two different counterparts. By arguing about opinions disharmony is created. For Pythagoras the number two was the number of disharmony, too. When we deal only with self and life, we create large disharmony in our society as can be currently observed in our daily life. It is to be mentioned that psychology works only with these two points and the interaction of human beings. The so-called Take-And-Control-Model is dealing with these two points, too. The self focuses on life, because it wants to control something. When someone tries to control another one else then it is an intervention into the self-sovereignty and self-determination of an individual. This influences the freedom of an individual and it has therefore the natural right to defend that. The intervention arises out of a strong need. To fulfill a need one wants to take it, but if it is taken without permission, then someone feels a loss. Does it sound familiar? Common sayings in our time are “What you want to have, you have to take.” and “When you want something happen, make it happen.”. That’s exactly the Take-And-Control-Model. That leads to disharmony. What we often forget is the third point of this model, which got completely out of sight in our so-called modern time. The third spot is theos in Greek and means god. The ancient word for god also means divine truth. 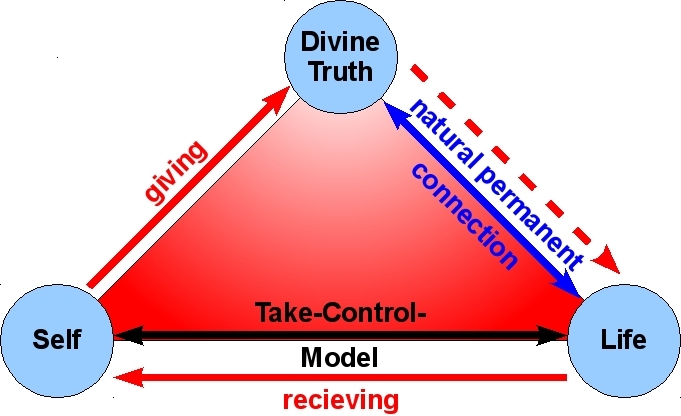 Life< and divine truth are connected directly. “The truth will reveal itself through life” is common saying. We are connected with the divine truth. We experience this connection as intuition, as feelings in our heart or belly. Sometimes we know, that somebody wants to phone us, we have experiences of deja-vus and so forth. The way of harmony is to serve the divine truth, to act and give in its name and to be rewarded for that through life. “Give and you will be given.” This sounds quite familiar for many people with different backgrounds and traditions. Expressed in a more general way: When we serve the truth, we will receive whatever we need through life. Some people don’t like the words serve and give, because it sounds like work and surrender. Giving in name of divine truth can also be understood as acting truthfully, being natural, honest and without any kind of affectation.